If you haven’t seen The Silence of the Lambs, you’re probably labouring under the common misconception that Hannibal Lecter is the villain of the piece. He is not. That honour goes to Buffalo Bill, a cross-dressing killer manufacturing a suit from the skins of his victims. But it’s Lecter who remains lodged in the public consciousness – and rightly so. Clarice Starling (Jodie Foster) plays a gifted young FBI agent investigating a series of murders by the aforementioned Buffalo Bill (Ted Devine) when she is sent to quiz infamous cannibal Dr Hannibal Lecter (Sir Anthony Hopkins) in his prison cell. The hope is that Lecter will be able to shed some light on the mindset of his heir apparent. This he does, but not before establishing a worryingly symbiotic relationship with Starling: in return for titbits of information about Buffalo Bill, Lecter quizzes Starling on her life and childhood and the two form a strong bond. Sir Anthony Hopkins’ performance is stunning. 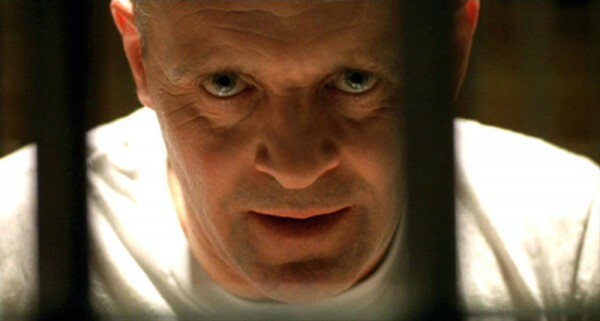 His Lecter is a creature of controlled stillness and measured calm, his voice hypnotic, his manner charming. And it’s this personable and easy intimacy which worries Starling the most. Lecter seems to see straight into her, sensitive to her personality and past – and despite her best intentions, she warms to him instantly. Of course, Lecter’s dark side eventually comes to the fore in an explosion of efficient and horrific violence and invention, made all the more horrific by his previously serene nature. Despite warning that he has eaten human liver “with some fava beans and a nice chianti” and murdering a fellow inmate by talking him to death, squaring Lecter’s murderous nature with his gentlemanly intelligence is not easy – until his inner psychopath is unleashed. Jodie Foster tries her best not to be overshadowed, but it’s a thankless task. Hopkins is only on screen 16 minutes and steals the show. The actress’ job is often merely to react to the male characters around her – a job she manages magnificently in a constantly evolving mask of revulsion, admiration and steely determination. Her skittish scenes at the film’s climax are fantastic and she gives a wholly convincing performance. Jonathan Demme’s film is not without fault and shows its age in places, but thanks to its two central protagonists and strong narrative, it’s a production which remains hugely powerful over twenty years after its release – a truly chilling horror film featuring one of cinema’s most memorable and quotable villains.